In today’s world intercultural communication is everywhere. The way a person deals with and adjusts to intercultural settings is dependent on one’s personality. The role of personality traits has been studied by many scholars and has proved to predict several outcomes such as job performance, job satisfaction, and job-related stress. However, the intercultural communication component remains little-known. In highly intercultural workplaces, such as the cabin on board of an international airline where contact between the cabin crew and culturally diverse passengers takes place, the importance of carrying a multicultural personality and performing effective intercultural communication should not be overlooked. A survey was conducted amongst KLM cabin crew members (N = 227) to examine the relation between a multicultural personality and job performance/satisfaction and the mediating role of intercultural communication and job-related stress. It was examined whether individual scores on the Multicultural Personality Questionnaire (MPQ, van der Zee & van Oudenhoven, 2000; 2001) predicted cabin crew’s job performance and job satisfaction. A new scale was constructed to measure the effectiveness of intercultural communication between cabin crew and passengers on board. Through a mediation analysis, the role of both effective intercultural communication and job-related stress was defined. Results showed that there is a positive relation between the five MPQ scales, i.e. having a multicultural personality, and levels of self-reported job performance and job satisfaction. The trait Cultural Empathy appeared most consistently as a predictor amongst the cabin crew. 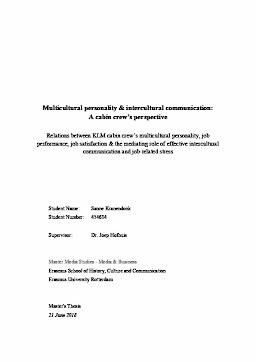 Furthermore, as was expected, it can be concluded that effective intercultural communication and job-related stress mediate the relation between a multicultural personality and job satisfaction. Intercultural communication, in contrast to job-related stress, also mediates the linkage between multicultural personality and job performance. In sum, cabin crew’s personality is related to the way they perform the job and the likeliness that they are satisfied with the job. This relation is partially caused the ability of KLM cabin crew members to effectively communicate with the passengers, but, considering job satisfaction, the level of job-related stress that is experienced by the crew is also of influence.